Eleanor has played violin for over a decade, completed a Bachelor of Music in Performance at the Queensland Conservatorium (distinction) in 2017 and been awarded her AMusA diploma on the violin. During her time at the Conservatorium, she gained extensive performance and orchestral experience, playing in the Australian Youth Orchestra, the Conservatorium Symphony Orchestra and the Queensland Youth Symphony. Eleanor also has several years of teaching experience, tutoring at beginner day camps and working for two years with The Music Generation. At Eleanor’s private violin studio, she welcomes all students of any age or ability. She tailors all her lessons to suit each individual student, whether they are preparing for an exam, just beginning their instrument or simply playing for fun. 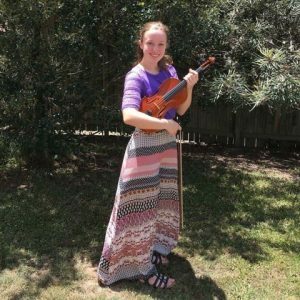 She also has experience teaching from a variety of beginner violin method books, as well as preparing students for AMEB exams. Ultimately, Eleanor wants her students to love what they are doing, because, in the end, that is the most important part of being a musician!